Our newly built accommodation is set directly on the harbourside at the edge of Kohukohu, within 5 minutes walk of the village centre. Our accommodation has five bed rooms each with deck and ensuite facilities, including a non-barrier wet floor shower. One of the double rooms has been layed out to be completely disabled access friendly, and can be fitted with another single bed or a cot if needed. The other rooms are access friendly for showering and sleeping. 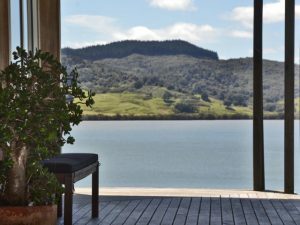 A refurbished Kauri building from the turn of the last century provides guests with a kitchen and dining room with more harbour views. This area is extended by a spacious roofed outside sitting area. Barbecues are available on the site for guests use.